My Super Nintendo remained plugged into my mom’s TV a LONG time. Mostly due to Tetris Attack being a game that was supremely addictive, and one that my mom, sister Laura, friends and I could play against each other on occasion. I also had the SNES GameBoy adapter, so my mom could play the original Tetris on the big screen with a real controller. The SNES remained attached to that TV long after we grew bored of those games, and long after I moved out when I went to college. I eventually did take the console back so I could break out Chrono Trigger, ActRaiser, Super Metroid and Super Mario Kart (among others) at will. Damn, that was a great system! The Playstation 1 and my Commodore 64 still remain at my parents’ house to this day, albeit unplugged. Happy 40th Anniversary of Earth Day, this Thursday, April 22nd! LDs? Those are like big CDs, right? that’s why we have gaming systems,so we can go back and play them years later and relive our youth. the SNES was such a fantastic system. so many great games, JF#300! First, Jefbot it totally right that you should unplug the stuff you never use. Anything that has a light on it or runs when when plugged in, even if turned off, draws a “phantom load” that can be substantial. Remember that all this stuff is not only burning energy unnecessarily, it’s also costing you $. Sometimes, it’s costing you $$$$. This applies to everything (coffeepots, etc), not just traditional electronics. Try to get in the habit of unplugging this stuff when you’re done with it. Nice one Shanna, i’m now working for a power company who as well as providing real time power meters to customers also have the next gen. of smart strips that have IR sensors on them so that when you switch on an appliance with the remote, the other related appliances are also powered up and vice versa. So using my tv remote when the toob is not even showing the standby light, powers up the box, my console, and the kick as stereo amp that gives the soun more guts and dare i say it balls! What is needed now is one that will pick up on the wireless signal from my dual shock 3 controllers. heh. controlling your system via dualshock would be pretty badass, Deaconvorbis! make it happen (then sell me one)!!! glad you liked the “greening” of JEFbot over the past couple strips, Shanna! and yeah, his eye’s getting better, but probably won’t be completely healed until after this storyline is over in another strip or two. Sooo not my case. Im a PC guy through and through. People like you and me are the reason emulators exist. yup! i used to download old ROMs all the time, Kerubim. now i mostly buy ’em via the XBOX 360 Marketplace and Wii Virtual Console. My brother plugged in our SNES the other day. Tried to play Super Mario World and all the words came out wacky. Last time I tried to play a LaserDisc the automatic A to B scanning didn’t work… and trying to get the thing open was something best done with a screwdriver. LD’s…..*falls over laughing* My Mommy STILL has these. Mostly karaoke ones…We Pixie’s are a talented bunch…. I still play my Sega Dreamcast every once in a while. Fishing is my favorite game of all things. Especially odd since you don’t Normally see La Pyratatical Pixie doing stuff that makes her glisten unless she’s got on “garb”. I’m hoping to start some veggie seedlings this weekend. Maybe some flowers too. OK! It appears today I am envoking the Hussy Hissy Spelling and Grammar rule… WOW look at all the creative use of spelling and Grammar! I told you the Pixie’s were talented! OH and did I see mention somewhere about a JEFbot book? is this something that is happening or a dream we are hoping for? Because Pixie WANT! heh. feel free to envoke the Hussy Hissy Spelling and Grammar rule anytime, Pixie! that’s right! karaoke LDs were pretty popular, Pixie! i only had a couple of them, though, and rarely watched ’em. i remember they had the cheesiest video backgrounds, tho! heheheh. i should pop one of those in again for some laughs. the Dreamcast is one of my most cherished consoles! it didn’t last very long but it had a GREAT roster of games! Skies of Arcadia, Sonic Adventure, Shenmue, Jet Grind Radio, Space Channel 5, PSO, Resident Evil: Code Veronica… the list goes on and on. i had Sega Fishing, too! with the fishing controller and everything. awesome. Ah, the SNES. How I miss thee. Thank God for emulators. All the games you could ever want from pretty much any of the classic systems, and its only about as illegal as downloading music! 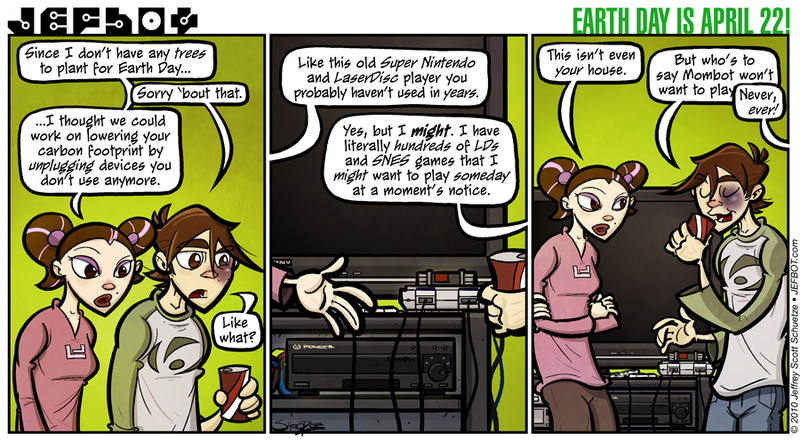 “I might want to play someday at a moments notice…” That is hilarious! Remind me again; SNES- is that the one where you can play Duck Hunt with the gun? I love the 90’s! Excellent job Jefbot! Go GREEN!!! and for Duck Hunt, take that first “S” off of SNES. It’s good to care aBOT the Earth!! leave it to you to make Earth Day and this strip punny, JP! I knew I needed to make Lacey my wife when I went to her apartment and saw she had an SNES hooked up to her TV and Dr. Mario in the system (in 2005 mind you). Love at first byte. dude, just you recounting the story has made me fall in love with her, 11TN. I am so like this, except at my own house and about way more than electronics. I have about six boxes of books that I don’t usually read but that I won’t get rid of because someday I may want to do some research on one of the topics they cover. And I almost never uninstall games from my computer because I never know what I’ll be in the mood to play, even if I haven’t played a particular game in a year or more. i hear ya, Sharra! someday, i’ll do a strip about all my books (i have more books than videogames at this point! ), including the ones i still have from college. and elementary school for that matter, heh. Don’t do it, Jeff! Nothing can replace ‘Streetfighter’ for the SNES! fyi, SUPER Street Fighter IV comes out next week, dude! time to get an XBOX 360 or plan another visit to SoCal! Great strip, bot! Very poignant yet funny! The colors and detail are amazing, as usual. I love how Mombot’s bubble interrupts Jefbot’s. Too perfect. Now if I could just get you to unplug the hair dryer. 😉 (J/K-folks) Bot unplugs the hair dryer, so he can play video games in the bathroom. 😉 (J/K again-folks)…maybe. ROFL!!!!!!!! They always say, there is truth in every joke. I bet JB does play games in the bathroom! but no plug needed. Bathroom games are the land of the handheld. Ok, I meant DS and iPhone… but it sounded so much naughtier. Funnyshaffer, are you crazy? That’s just Nintendo, not Super Nintendo! But I agree about the moment’s notice. Brilliant! OMG JB, this hit home. To this day, and I kid you not, my nintendo, SNES, Sega Genisis and Dreamcast are all still plugged into a TV in the front room of my dad’s house. It’s a good thing he doesn’t go into that room much, cuz living 300 miles away he might start getting crazy ideas…. *grumble* Cant ever tell when I might want to jump in my car and drive 300 miles to play some Contra or something!!! you have a Sega Saturn, by any chance? Inspired man, unfortunately my Atari 2600 has departyed for silicon heaven, (no silicon heaven, then… where do all the calculators go?) and since i got the PS2 i donated the PS to one of my nephews. But I still have my Atari ST, Dreamcast and PS2 at home under the toob, i think the PS3 might be picking on them when i’m out at work though. As for Sis’s argument and 3rd pannel body language, i’m beginning to wonder if you’ve ever met my sister, ‘cos you got her down pat. Awesome work man, keep me smiling. maybe your sis and my sis should meet? or would they just conspire and do bad things against us? Does anyone else think the SNES was a beautiful system with the cartridge in it? I just love how it looks….. Ah I miss those days. I had a sega instead of an SNES, not as pretty but just as fun. TELL ME ABOUT IT, nicobot! if i could just get rid of the things i *might* use again, my apartment would be downright spartan! Love the lowering the carbon footprint bit. Very funny…and good to do. Unplugging is a simple thing to do, but very difficult for some(like Jefbot) to do. It was great to see Jefbot at Santa Clarita’s Earth Arbor Day Festival. yes, sometimes it’s the simplest things that are the hardest to do, sis. i’m *really* gonna try and unplug more stuff around my apartment for Earth Day, tho. was great to see you at the Earth Arbor Day Festival, too! The last place I lived in had a great antique shop nearby. Star Trek!? tv shows or movies? pretty awesome either way, Holaved. i’ve gotten a couple LDs from places like the Goodwill. NES cartridges, too! Ah, the SNES, good times. It’s funny that it should come up, as I recently found my old Sega Genesis model 1 console. I’ve been playing Rocket Knight Adventures at every free moment. It’s so additive and fun I can relate to the feeling of always wanting the system plugged in, and you gotta love those Sega games that are actually GOOD, but I’m sure once I’ve conquered that game I’ll pack up the Sega once more. Earthworm Jim! He should be like an Earth Day mascot for gamers who want to recycle their electronics. Earthworm Jim has enough nostalgia points to pull it off I think. i think you’re right that Earthworm Jim should be the Earth Day mascot, Foxmouse, in that he represents animals and the Earth well and can totally beat up any polluters or litterbugs. glad you’re likin’ the storyline, Foxmouse. hope i’m spreading a little awareness of Earth Day while not being too preachy. and most of all, keeping true to the characters with some humor thrown in. ooh, i’d love a copy of Rocket Knight Adventures, since i’ve heard it’s a great game! has it come out on the Virtual Console yet? i might just have to find a cartridge on eBay. Oh totally the first Rocket Knight Adventure game would be a wonderful addition to your gaming collection, but I don’t think the original game isn’t out on VC yet so yeah, you may have to buy a copy from ebay. So worth it though. The game is complex in it’s simplicity, and I believe that makes for an entertaining challenge. There is a “sequel” scheduled to release this year for the 360 and Playstation. I think it looks very interesting so far. Sorry to reply again, but I just thought if I could pick one thing that would sum up the whole game it would be this song from the game. It’s played only once in the game as part of a level that is so short it’s heart breaking. Enjoy~! sweeet, i always wondered how you did the glasses dude. Love the detail of everything in the background behind them. And Mombot’s “Never, ever!” made me laugh. I was going through my boyfriends 8bit Nintendo games to help jump start inventory so he can catalog it all. It took me back to the days of when I used to play mine. Have you ever watched The Angry Video Game Nerd? I may have asked you before, and sorry in advance if I have. If you haven’t, you seriously have to check it out. If you have, what’re your thoughts?